A False Prophet prophesies on behalf of God with a lying tongue for money power and position. He/She will murder to continue the illusion of truth. A False Prophet will carry a superiority ambiance to worship their self and to get others to worship they will exalt themselves before others. They will brag about their accomplishments and display worldly possessions including flashy cars, jewelry and even churches. There is a lack of modesty. A False Prophet carries and Idolization of other things, the opposite sexes or even same sexes (in private). There is a lust demon that transfigures the False Prophet’s desires into promises of Fame. They will usually idolize other, objects, people, cities and government. They will expect their following to idolize what they idolize and want them to idolize those things. They will spread false and inconsistent prophecies and tell lies to shift the accountability. A False Prophet will use manipulation on their following usually in the form of guilt and shame for questioning and not being faithful with you time, money and attention. False Prophets exaggerate the truth or even a lie. If only 200 people came to the services they will say 400 came. EVERYTHING must appear to be bigger! The False Prophet will steal the prophecies right out of the mouth of a true prophet and ridicule and smear the true prophet’s CREDIBILITY and name. They want the spotlight and the following. A False Prophet will usually harbor you. They will not want anyone else to take up your time including your spouse. They are jealous of any relationship you carry with others because they are afraid you are going to give someone else their monet, they should be collecting. They are professional hustlers representing God. A False Prophet enjoys the praise of man and perfers not to give any praise to God. They will endure an amen but inwardly they desire the glory. You are able to identify them by their fruit. A False Prophet desires your worship and they think they are invincible but you are replaceable. They are highly self-centered. They are not givers and very seldom offer people salvation. You escape the grasp of a false prophet by something very simple. Do not communicate with them. Do not watch their teachings, don’t attend their services and if they call simply; don’t answer. Block all communication. Now you are free! Your Prophetic Word ARISE and COMMAND! Last month God gave you the word Arise! This month he has added to the word Arise and Command. I am commanding those things as though they were in YOUR life. I prophesy the word command because as God prepared the Armies to move out in the Book of Numbers 2nd Chapter, the Bible declares they moved out by companies. In a company we will find a leader and in a leader we will find a servant and in a servant we will find submission. To command the submission to Christ activates your destiny. We are in a Prophetic Season of Harvest! Earlier this year we celebrated the season of Jubilee and we found out during the Shimatah which took place every 7 years. This was the year of release (Deuteronomy 15th Chapter). Well when the 7 years fulfilled, 7 more years the big release came so, in the 49th year every blocked blessing was given to the Children of Israel. God has revealed to me, THE BODY OF CHRIST is in the celebration of the 50th year! This is the season to command! 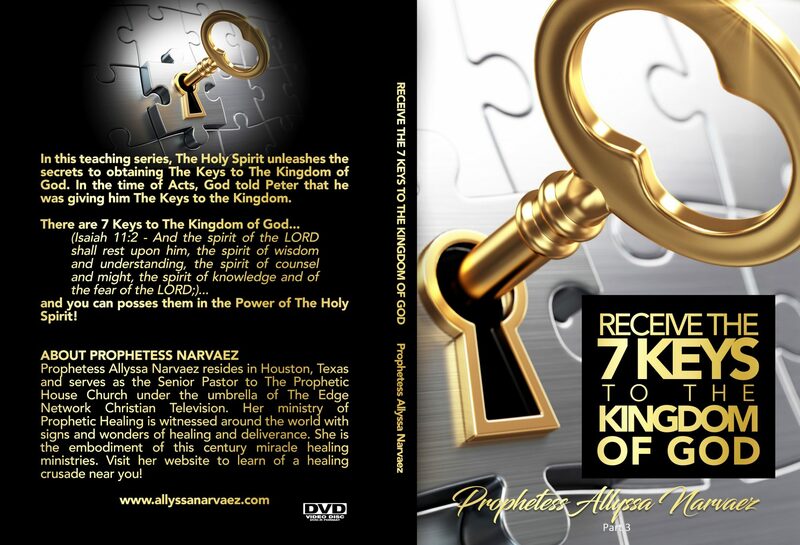 This blessing God is releasing is specifically for the Covenant Partners of Allyssa Narvaez Ministries. Good Health, Strong Finances, Healthy Relationships and Personal Spiritual Growth have been assigned to you, our Covenant Partner. My life has been blessed with the Prophetic Gift because I trusted God while making a vow to serve him FULL TIME! Being a full-time servant is challenging but being a part-time lover of God is disastrous. I have found that when I became a full-time dedicated servant of Jesus Christ thenn he gifted me. I now take the Gift of Prophesy and use it for Christ’s Kingdom. We are learning with the Prophetic Word to you this month; being C-O-M-M-A-N-D, God has commanded that all areas of your life line up with peace! God has commanded that all areas of your life line up with joy! God has commanded that all areas of your life line up with prosperity. To prosper means to grow and if God has commanded that the trees and flowers grow he has also commanded that you grow!VThe Bible declare that God gives your hand to prosper ( Genesis 39:3 & 23) and with commanding your hand to prosper I see new relationships forming for you. I see God placing you in front of the RIGHT people to cause your hand to prosper. God commanded that the bones in the dry valley would raise up and become and exceedingly GREAT ARMY. C-O-M-M-A-N-D! GOD REVEALED IN LUNCH WITH THE PROPHETIC THERE WOULD BE A FINANCIAL DEFICIT. IN THIS MONTH OF APRIL THE SHORTFALL WAS ANNOUNCED FROM THE WHITEHOUSE. HE ALSO REVEALED A NEW SCIENTIFIC RESEARCH THAT WOULD DEVELOP TO PINPOINT YOUR DESCENDANTS HE DIDN’T TELL US THE DESCENDANT WAS HIM CHRIST . READ ABOUT THEM BELOW. ARE YOU FROM THE BONES OF CHRIST? March 31, 2017 “Listen I hear the Spirit of God saying that there is going to be a deficit found in the Federal Government. A deficit. They are going to say they didn’t know it was there. It is all a set up because the false beast is getting ready to take over the world. He is getting in position right now. And we know that the wealth of the world is in China’s hand, it is stronger economically with China. And I hear God saying that the United States, they are going to find a new deficit and they are going to blame it on those who were in office before. But I hear the Spirit of God saying that it is so that the enemy can get into positions, talking about the false beast. The false beast of the Brexit System. Listen to me very closely God said that everything has shifted in the world that everything is in a One world Order as far as finance. Why do you think that everybody is fighting? They are not fighting over the power but the money.“ Read About It Here , Read More About It Here! Do you dream? I dream. I dream all the time. I dream so much that I have published two books. You can learn about the books at the bottom of this newsletter. The first book of dreams I wrote is titled 30 Days of Dreams and Visions. The second is entitled The Prophet’s Spiritual Demise. On April 29th I had a dream of warning. God sends us messages in our dreams. Send me your dreams here and I will give you the message through the Holy Spirit! On this particular night I dreamed about a massive Pit Bull carmel-colored dog and its owner. The Pit Bull was so large his muscles protruded beyond his ribs and his head was over-sized. He was walking along the highway. After reporting to his master his master released the over-sized pit bull that was the size of a lion. He reminded me of a lion but his meat- head reminded me of the ferocious jaws that lock on their prey. I was too fast for the pitbull and as I out ran him the pit bull got wedged behind a very tall fence. My question was why would my neighbor send such a man-eating animal to attack me. As I was waking in the height of REM (Rapid Eye Movement) I heard the Voice of God say, “Satan hath desired to have you, that he may sift you as wheat: But I have prayed for you that thy faith fail you not. Trust In Me.” It was so clear God was telling me not to doubt him when I have a need for the ministry. To doubt God is to fail him. The enemy will come to have your faith, but Jesus is praying for us. Jesus knows your need before you ask and if he has given you a job then he will provide. God has given me a job! Build his kingdom in the world. As I labor to build A Prophetic Center and Healing Ministry, God will provide everything we need. As God builds your life he will send you everything you need. God is giving away kingdoms and cities and I prophesy your city into your hand. The hand of the city is in the heart of a king! May God bless your heart and hands to prosper. To keep it short, I felt you speak life intr my spirit. I’m struggling to stay in Faith, As I constantly begin to doubt because I’m used to thinking negatively all my life, So I am struggling remaining calm, But right after I heard your message, I went to sleep and I woke up feeling refreshed, Like I haven’t felt in ages, Like I actually felt good when I awoke. Rested. I’m believing the Lord for that job. God Has Given You A New Healing CD Series! Be On The Look Out! WHEN YOU GIVE INTO THE MINISTRY AS A PARTNER, I FAST FOR YOU WEEKLY! GOD SAYS In Mathew 17:21 Howbeit this kind goeth not out but by prayer and fasting.